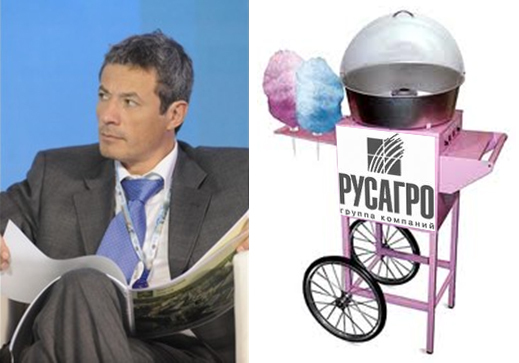 SWEETS FOR MY SWEET, SUGAR FOR MY HONEY – VADIM MOSHKOVICH HELPS HIMSELF – IS RUSAGRO FAIRY FLOSS OR DROSS? Vadim Moshkovich – Senator from Belgorod, owner of Rusagro (aka Ros Agro Plc), which sold its shares in London last week — has been singing this golden oldie from The Searchers (1963). Don’t miss the last chorus line: “I’ll never ever let you go…Oooooo, Oooooo, Ooooo” Rusagro was 94% owned by Moshkovich until the initial public offering (IPO) which was implemented in London last week; his wife, Natalia Bykovskaya, owns another 1%, both of them through Shiny, a British Virgin Islands-registered company. Vadim Basov, their employee and chief executive of Rusagro, owns 5%. Basov bought his stake from Moshkovich a few days before the listing began, paying $15 million. He and Moshkovich thus valued their company at $300 million. 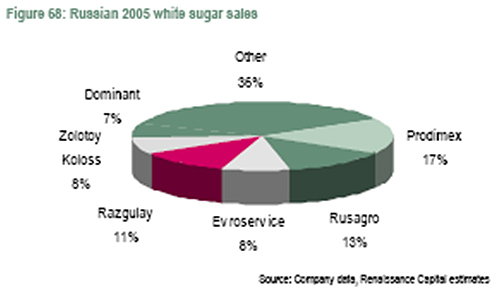 But Rusagro is reported in the trade media to be the third, possibly the second largest sugar producer in Russia (after Prodimex and Razgulay). It reports assets worth a total of about $1.4 billion, and last year, when Sberbank was reportedly intending to buy most of the shares for sale, the market was asked to value the company at between $1.2 billion and $1.6 billion. This month, almost a year later, the irrepressible Bloomberg reported (according to “two people with knowledge of the sale”) that Rusagro was valuing itself at between $1.8 billion and $2.2 billion – a 37% to 50% premium over last year’s IPO attempt. What can have lifted the valuation of Rusagro so strongly, and what reason would a creditor bank, or state lender like Sberbank, have for accepting this liftoff in Moshkovich’s share value, unless that is already pledged and collateralized for Rusagro’s current debts of more than $735 million? Who else would gain from a premium-priced share, apart from Sberbank and Alfa Bank, as Rusagro’s biggest creditors? In addition to sugar growing, processing and refining, Rusagro has a meat division, an oil and fats division, and other agro-businesses. But in the latest report for 2010, sugar accounts for 66% of the group’s sales, and 57% of its earnings (Ebitda). Rusagro claims to be “a leading Russian sugar producer”, and reports that it accounts for 16% of the domestic sugar produced, processed and sold in the Russian market. The company says it has the ambition “to become the largest player in the sugar market in the Commonwealth of Independent States”. But it won’t assist investors or the markets at large by comparing its market shares to those of its domestic peers, and it won’t identify its competitors. 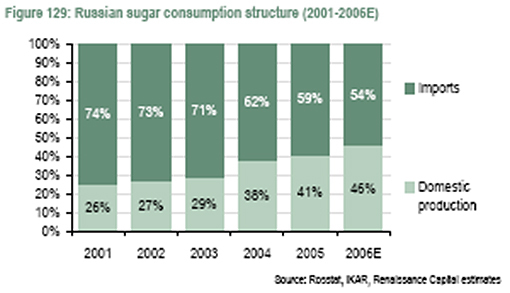 For a long time Russia has been the world’s biggest raw sugar importer. In the Soviet era, it was supplied by Cuba and other countries in exchange for oil and other commodities and goods. The dynamics of this business changed dramatically after the collapse of the USSR in 1991. By 2005 Russia was refining almost 3 million tonnes of raw sugar, most of which was imported from Brazil. But – and this is the key to the current business rivalry in the Russian c sugar sector — the share of domestic consumption produced from imported sugar has been declining, and import substitution by domestic sugar beet growers and processors has gained in strength and market share. “Prodimex (21 sugar plants, FY06 modernisation capex $30mn) is looking to increase its market share to 25%, its volume of own produced sugar beet processing is forecast to grow from 3.1mn tonnes to 3.6mn tonnes in 2006. Rusagro (7 sugar plants with an outlook to increase number of plants to 12) plans to invest up to $100mn in 2007-2009 to modernise its sugar refineries. It also plans to increase its market share to 25%. If the London market judges a proprietor or a company on its performance, it appears that at 16% today, Rusagro has fallen well short of its 25% market-share target. On the other hand, Rusagro’s financial data show that the sales figure for 2010 of Rb31 billion ($1.02 billion) was up 26% on 2009. At Rb5.2 billion ($168.5 million), bottom-line income was up 122%. Moshkovich cannot be found easily in the documentation circulated last week by his company to London investors. One reason – the company doesn’t publish shareholding or financial reports on its website. Its spokesman, Sergei Tribunsky, said today that Rusagro will not disclose its prospectus, or the audited, international-standard financial reports for its last three years “because of the silence period of 30 days since April 14”. So to understand what Rusagro was selling, and how successful the sugar oligarch was, you have to find someone who received a prospectus and is willing to share it. Here it is. The history of Moshkovich’s asset accumulation is also ignored. The Russian media reports on the company’s history are replete with allegations that he used unlawful asset takeover tactics to fill out his sugar division and also his seed and vegetable oils division. It is also alleged (in an unsubstantiated report by Kommersant, February 26, 2006) that Moshkovich sought his seat on the Federation Council to assure himself of immunity from prosecution, in the event of repercussions from this history. There is no comment from Moshkovich at his Senate office to the claims, allegations, and innuendoes. This silence doesn’t make them more credible, nor Moshkovich in any way culpable. But the silence doesn’t make his company creditable either. “Our controlling beneficial shareholder and his family have the ability to exert significant influence over us, and their interests may conflict with those of other holders of our Ordinary Shares or the holders of the GDRs. • We have engaged and may continue to engage in transactions with related parties that may present conflicts of interest. • Our minority shareholders or minority shareholders of our subsidiaries may challenge past or future.interested party transactions or other transactions, or may not approve interested party transactions or other transactions in the future. In its disclosure of related party transactions, Rusagro appears to have played sugar-daddy to other Moshkovich companies, including real estate developer Avgur Estate. In the three years, 2008-2010, it loaned the other Moshkovich companies Rb1.6 billion (about $53 million). It was also on the receiving end of loans from two Moshkovich companies, Finansoviy Resurs and Masshtab, for Rb7.2 billion ($241 million). These latter are all reported as having been cleared by the end of last year. When Bloomberg reported promotionally in January of this year, it claimed that the company was aiming at raising $500 million in its IPO, “according to the people, who declined to be identified because the matter is confidential.” By this month, as Rusagro’s promoters started their marketing campaign, the fund raising target was down to $330 million. The Russian newspapers were told the shares on offer were “three times oversubscribed” at a price of $15 per share, indicating a market capitalization of $1.8 billion. The prospectus also reports that in the dealing Moshkovich arranged for his own account in last week’s IPO, he sold 2 million GDRs (400,000 shares), with another 3 million GDRs (600,000 shares) for sale in the special allocation (over-allotment option) for the underwriters – Credit Suisse, Renaissance Capital, and Alfa Capital. His cash take appears to total $75 million. The ratio of the company’s take to the oligarch’s — 4 to 1.